An electro-rock journey exploring human storylines where personal redemption, expiation of the past and the struggle to make amends is concerned. A journey back to the roots, a tortuous path for shaping a new start. 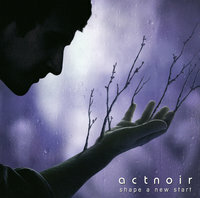 "Shape a New Start" is a step forward in the musical research of the band, presenting a brand new sound where electro and rock perfectly melt. The junction point between bands such as Depeche Mode, Perfect Circle, Radiohead and Nine Inch Nails.